Federal Hill is Providence’s version of Little Italy or the North End; Italian restaurants are densely packed on Atwells Ave, the main street of the neighborhood. It is also a quick walk from the Convention Center, so it will be a convenient destination for bridge players. Since there are so many Italian restaurants to choose from, I relied on personal recommendations; one from my co-worker Nicole who went to school in Providence and another bridge player who had been there earlier in the week. I went with Steve, and our friends Doug and Steve A. 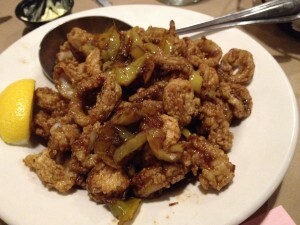 We shared the fried calamari ($10) to start; the rings were tossed with a balsamic vinaigrette, onions, peppers and capers. 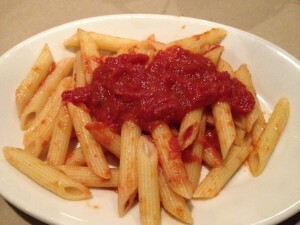 It was sharp and acidic, in a good way – a nice departure from the standard marinara. I just wish that the tentacles were served as well. 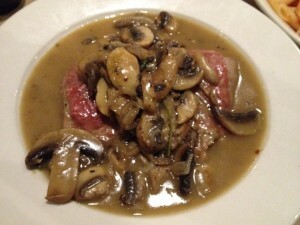 Steve and I shared the veal saltimbocca ($20). I have no idea what they gave us; the saltimbocca was listed as served with a white wine veloute sauce. Does that look like a white sauce to you? It was a brown gravy, stingingly acidic (someone in the kitchen loves vinegar), over an average piece of veal. It comes with potato, pasta or vegetable. We opted for penne that was a hair overcooked. They plated the entrée and pasta separately, so those are ½ portions in my pictures. They charged a $4 plate splitting fee for that. I wish restaurant would either let you know up front, or not bother plating them separately - I have no problem splitting the dish myself. Doug and Steve A. both ordered the carbonara ($16) and it was excellent. A huge portion of correctly cooked pasta tossed in a rich creamy sauce, studded with bacon and peas; it was a textbook rendition of the classic dish. The surprise of the evening was asparagus ($8) – it was outstanding. The tender spears were perfectly cooked and seasoned. 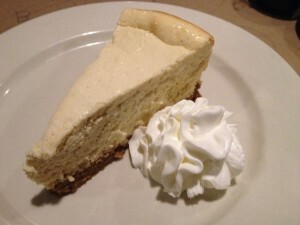 Steve A. and I shared the NY style cheesecake ($6) for dessert. It was appropriately dense, thick and creamy. Our service was good, portions are large and prizes are reasonable. Cassarino’s is a great option for the Hill.